This collection of highly original narrative poems is written in the voice of frontiersman Daniel Boone and captures all the beauty and struggle of nascent America. 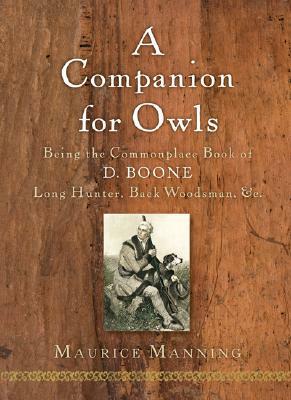 We follow the progression of Daniel Boone's life, a life led in war and in the wilderness, and see the birth of a new nation. We track the bountiful animals and the great, undisturbed rivers. We stand beside Boone as he buries his brother, then his wife, and finds comfort in his friendship with a slave named Derry. Praised for his originality, Maurice Manning is an exciting new voice in American poetry. beneath two ridges, sunk like a stone. MAURICE MANNING is the author of four previous books of poems. His last book, The Common Man, was a finalist for the Pulitzer Prize. A winner of the Yale Younger Poets Prize and a Guggenheim Fellowship, he teaches at Transylvania University in Lexington, Kentucky.